Wages and benefits under Teamster contracts are markedly better than those of non-union employees in similar jobs. Teamster contracts are the guarantor of decent wages, fair promotion, health coverage, job security, paid time off and retirement income. The Teamsters Union also performs vital tasks in such areas as pension management, safety & health, community outreach, governmental affairs and communications. For more than a century, the Teamsters have been a public voice for the rights and aspirations of working men and women and a key player in securing those rights. Forming a Union at your workplace gives you and your co-workers the power to be heard and to stand up for your families, your future and yourselves. The Teamsters are your voice in labor. 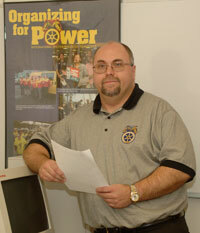 To speak to a Representative in our organizing department, call Teamsters Local Union No. 429 at 1-800-331-4290 or goberg@teamsterslocal429.org. All calls and correspondence from people interested in organizing will be held in the strictest confidence.